Highlight. Mark a single word or a passage in a block of color. Notes. Insert a comment (up to 512 characters) about the highlighted word or phrase; the date and time are included. 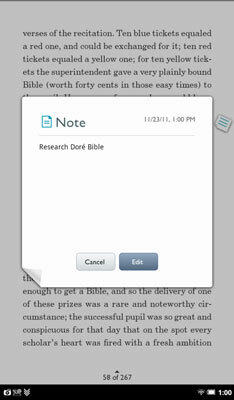 A small icon, like a sticky note, will appear along the margin and you can search for what’s in your note later on. You can view and change notes any time. You can also make them invisible. Why? Perhaps you want to share a selection or loan a book to someone but keep your comments private. View All Notes. Tap the page to display the reading tools. Tap Content. Tap the Notes & Highlights tab. Edit a Note. Tap the Note icon you want to edit; it appears onscreen. Choose Edit and use the keyboard to make changes. Tap the Post button. Remove a Note. Tap the highlighted word or phrase. Tap Remove Note. Make Notes Visible or Invisible. Tap the page to display Reading Tools. Tap the Content icon. Tap the Notes & Highlights tab. Slide the On/Off switch labeled Notes & Highlights to the setting you want. Change the Highlighting Color for a Note. Tap the highlighted word or phrase in the passage associated with a note. Tap the highlighting color you want to use. Contacts. Choose one or more e-mail contacts to send the material to. If you haven’t set up contacts or need to expand the listing, tap the Add Contacts button to fill in a form with a name and e-mail address. On Facebook. Post a quote and a short message on your own Facebook wall or on a Facebook friend’s wall. Via Twitter. Post a short quote (limited to <140 characters) using your pre-established Twitter account. At the lower right, a number tells you how many characters you have left; a negative number means you’re over 140. Look Up. Search for a word’s meaning. To use Wikipedia or Google search, you need a working WiFi Internet connection. In the Dictionary. Tap the Look Up icon and a pop-up window will display the meaning, if one is available. To close the window, tap anywhere outside the window. In Wikipedia or in a Google search. Tap the Look Up icon; the pop-up window appears with a dictionary definition (if available). Tap the Google icon to search, or tap the golfball-like Wikipedia icon to look there. Find. Tap the Find button to search the entire book or document. All instances of the word or phrase are highlighted and displayed in a box; jump to any of them by touching their entry. You may be reading an unsearchable PDF.